We all love happy game endings — no matter what it takes to get there. Of course, we shouldn’t expect the 2014 Cardinals to do anything different in October than what they did the previous six months before they reached the NLCS, right? Why wouldn’t Game Two of the NLCS be filled with drama and a range of emotions, when it’s this team playing? The Cards had good, bad and ugly before the ultimately satisfying and joyful conclusion of a walk-off 5-4 win over the Giants. Actually, we probably didn’t expect how they won last night. Four home runs from the team that hit the fewest in the National League during the regular season — even though they had turned on the power in the NLDS against the Dodgers. You really can’t script October. Although, if we could, we certainly wouldn’t want any kind of story to include an injury to Yadier Molina. But that unfortunately happened, as a strained left oblique forced him from the game in the sixth inning. No update on his condition yet today, but we all know that kind of injury takes time to heal. The game was tied 2-2 when Yadi left, after the Cardinals took a 1-0 lead in the first on (who else but) Matt Carpenter’s solo homer and a 2-0 lead with a bases-loaded Randal Grichuk single. Both obviously contributed to the “good” portion of the game. Lance Lynn allowed a run in the fifth and another in the sixth that tied the game — definitely not good — and Yadi leaving in the bottom of the sixth meant Tony Cruz entering. That was followed by more bad: a lead-off walk in the seventh to Brandon Crawford by Randy Choate who was then replaced by Carlos Martinez, a passed ball by Cruz that moved Crawford up, a single by Michael Morse, a sacrifice bunt and then a single by Gregor Blanco to score Crawford and give the Giants their first — and ultimately only — lead of the night. Yet that lead didn’t last long, thanks to the pinch-hit heroics of Oscar Taveras. Much could be said about Oscar’s lack of playing time (and, actually, John Mozeliak did say plenty) yet, as has happened more than once this season, Oscar rose to the occasion when given the opportunity and hit a game-tying homer. Then came a three-up, three-down, 15-pitch inning by Pat Neshek in the top of the eighth for even more good. In the bottom, Matt Adams gave the Cardinals a lead — very, very good! — with a no-doubter homer in the bottom of the eighth. Which obviously brings us to the top of the ninth and Trevor Rosenthal. It’s not a surprise anymore that Trevor doesn’t have a one-two-three inning — yet much more often than not, he gets out of his self-created jams. Things did not go well after Rosenthal struck out Crawford. Back-to-back singles brought up Blanco again. On a full count, he lined to Jhonny Peralta at shortstop, who jumped to make the catch .Two outs, Joe Panik up … and panic was what we all did as ball four to him bounced in front of the plate and past Cruz for a wild pitch that he couldn’t locate at first. Since there were two outs, pinch-runner Matt Duffy was off with the pitch and ultimately scored the tying run. After Rosenthal walked Buster Posey to load the bases with Pablo Sandoval coming up, Mike Matheny had at last seen enough. In came Seth Maness, who retired Sandoval easily. From the worst, the best can come — right? Which brings us to the lead-off batter of the bottom of the ninth, Kolten Wong. Albert Pujols never hit a walk-off October home run for the St. Louis Cardinals. Mark McGwire? Nope. He never hit one, either. Stan Musial? Nah, not him, either. But Kolten Wong, all 5-feet-9 of him? He’ll be dancing around the bases for the rest of his life. Heart pounding. Arms waving. Helmet flying. Fireworks exploding. His feet almost forgetting to touch the bases, not to mention the earth itself. This was Kolten Wong’s freeze-frame October moment. At 10:50 p.m. Jubilation Daylight Time. On a Sunday night he’ll never forget. 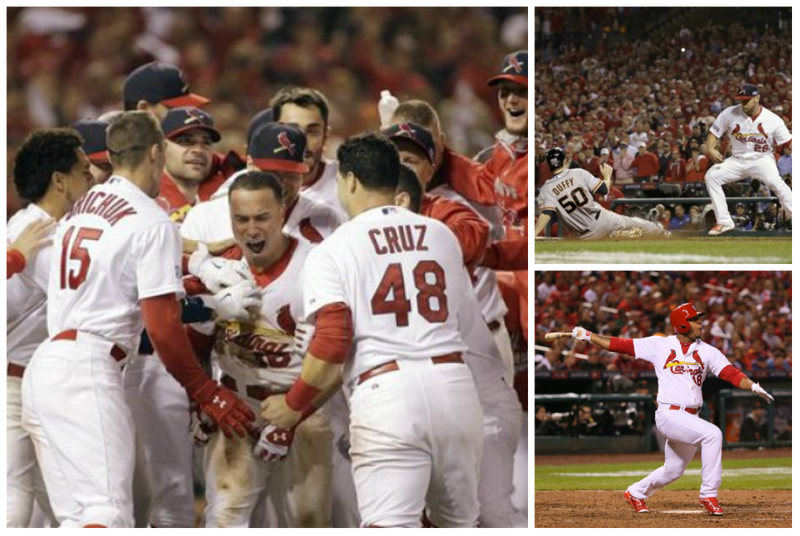 Wong’s blast joins those other three postseason walk-offs we can all name and remember glowingly: David Freese in the 2011 World Series, Jim Edmonds in the 2004 NLCS and Ozzie Smith in the 1985 NLCS. Last night’s four homers — all by lefties, even all by former Quad Cities River Bandits — and the win helped ease the loss of Yadi for the team as well as for us as fans. Ugliness really can bring joy. And beautiful memories. Now it’s a five-game series, resuming tomorrow afternoon at 3 p.m. Central in San Francisco. It’s another compelling pitching match-up, with John Lackey facing Tim Hudson, who’ll be making his LCS debut after six losing times in division series throughout his career. With all that happened in Game Two for the Cardinals, there’s no telling what will happen tomorrow — especially since these are the 2014 Cardinals who will be taking the field. This entry was posted in 2014 Cardinals and tagged 2014 postseason, Kolten Wong, Lance Lynn, Matt Adams, Matt Carpenter, Oscar Taveras, Pat Neshek, Randy Choate, Seth Maness, Trevor Rosenthal, Yadier Molina by Christine Coleman. Bookmark the permalink.